This 2016 Loading Doc introduces a heavily-tattoed Englishman living in Rarotonga. 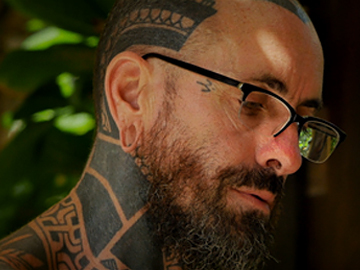 Croc Coulter is an unlikely master of the traditional art of tātatau (tattoo); the documentary follows Coulter as he teaches the art form to an apprentice, Moko Smith. Coulter also lives with cystic fibrosis. 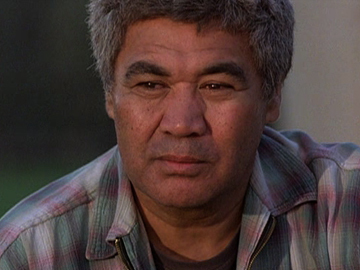 It was directed by Robert George, who has Cook Islands Māori and Māori heritage, and a background as both a painter and in post-production work for the screen. The mini documentary was shared internationally; it also featured on National Geographic's Short Film Showcase. 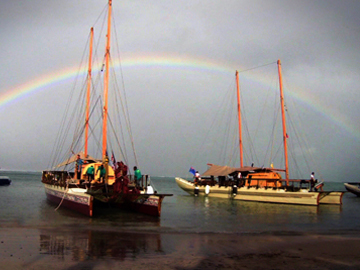 In this 2010 Tagata Pasifika story, reporter Adrian Stevanon follows efforts by a group of Pacific Island mariners to preserve the traditions and skills of the great Polynesian voyagers — as an armada of canoes from the Cook Islands, Tahiti, Fiji and Aotearoa takes to the seas of Te Moananui a Kiwa (the Pacific Ocean). Stevanon has zero sailing hours when he joins the Pan-Pacific crew of Hine Moana in the Cook Islands, en route to Samoa. Unsure “if this city boy can handle the high seas”, he takes time to find his sea legs, but eventually gets on the foi (tiller) and into ‘vaka mode’. In this short film, a Cook Island school cleaner (Whale Rider's Rawiri Paratene) responds to an unusual graffiti message on a girls’ toilet wall, with life-changing consequences for him and the mysterious author. 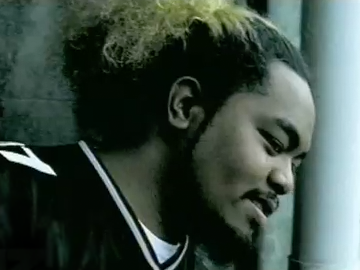 Paratene's performance won him a Qantas Film and TV Award; the film also won Best Short and Screenplay (Paul Stanley Ward). Tupaia travelled to more than 15 festivals and director Chris Dudman was nominated for a Leopard of Tomorrow (Best Short) at Locarno. Dudman, Ward and producer Vicky Pope teamed up on another short film success, Choice Night (2010). This documentary charts the journey of Auckland hip hop band Nesian Mystik, from their beginnings as an inner-city school band at Western Springs to gold albums and international acclaim. Filmed in New Zealand, London and Tonga the documentary explores the multi-cultural roots of the band members and the inspiration for their lyrics. 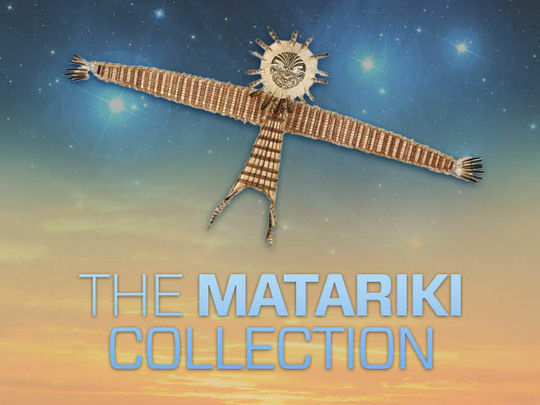 Director Makerita Urale uses the Nesian Mystik story as a lens to reflect the wider picture of Māori, Pacific Island and Pakeha society in New Zealand. 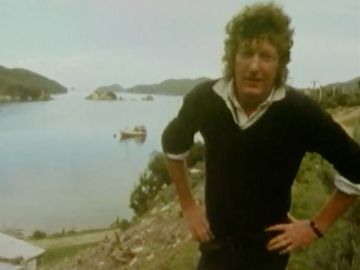 Poet Sam Hunt goes "between islands" on a home turf tour. To a backdrop of languid 'good day' Strait's scenery, he yarns with locals about stories of land and sea, and recites poetry: "[it's all about just] standing back and listening ... or watching". He chats with poet Alistair Te Ariki Campbell, goes groper fishing off Mana, and hears of a plan to float on a flax flutterboard across the Strait. Hunt then gets himself across via ferry for whaling stories at Oxley's Rock pub and meets boatbuilders and Cape Jackson farmers. The Costa Botes film includes (brutal) archival whaling footage. Presented by Niuean broadcaster Foufou Susana Hukui, this first episode of the long-running Pasifika current affairs series includes items on Cook Islands dance, the “Otara flea market”, and NZ work schemes for islanders. Samoan Maligi Elvie presents South Pacific news, while Vainetutai Temaeva-Nicholls covers the Cook Islands. Debuting on 4 April 1987, the TVNZ series broke ground as the first NZ television show to focus on PI stories (earlier show See Here was aimed at both Māori and Pasifika audiences). Researcher Iulia Leilua went on to report for Native Affairs. Actor Robbie Magasiva and discus champ Beatrice Faumuina oversee this hour-long Tagata Pasifika 20th birthday celebration. 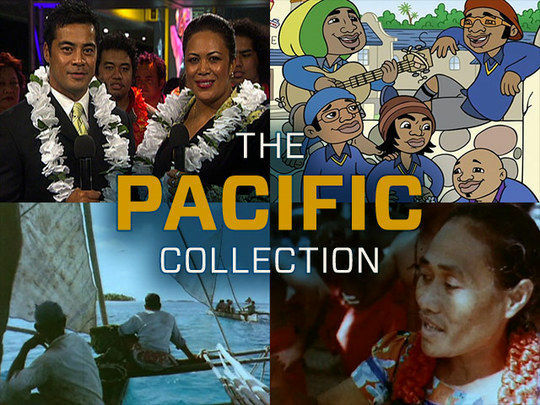 Presenters past and present survey changes in the Aotearoa PI community over the show’s run: from education, arts and culture (Ardijah, OMC, Michel Tuffery’s corned beef bulls and the Naked Samoans), to political pioneers (Mark Gosche, Winnie Laban), and sports heroes (All Black icons Jones, Lomu and Umaga). 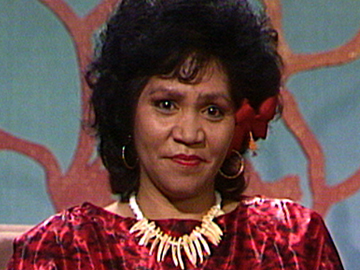 Among those talking about the show’s importance to NZ Pasifika culture are Helen Clark, Annie Crummer and many others.